During a aha moment . . . . you know the one you have while perusing through a magazine or shopping at a favorite store where you say, oh, I love it, but I can probably make that, and after much thinking and sleepless nights you actually find a way to put it all together. Yay, man! That's what happened to me when I saw pictures of a coral hurricane on Frontgates' website. So pretty, but too, too expensive for me at $175. The details on the white one are hard to see . . .
and I'm so tempted to paint mine in a shade of purple after seeing it in red! There are some purple coral, you know! 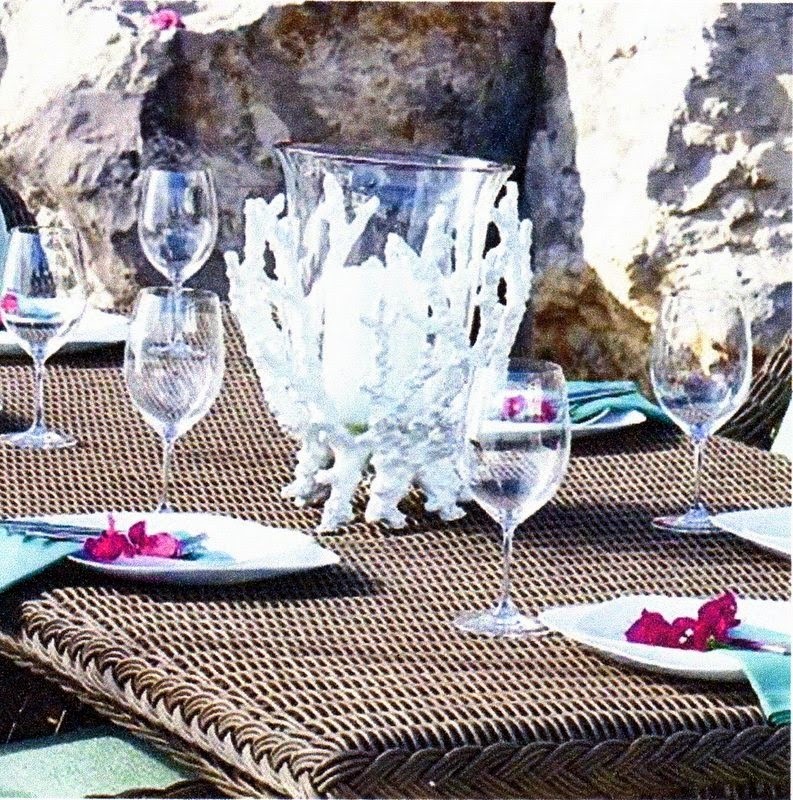 Oh how I wanted to re-create this faux coral accent piece! I don't sleep well and wake up quite often during the night. Usually I just go back to sleep after awhile, but with this, all I could think about was how I could make it. I had made a starfish bowl here and also a wired candleholder here and remembering how I did those two helped me put the coral candleholder together. Using 16 gauge white cloth wrapped stem wire as the foundation, I wrapped four stems around a glue bottle to get spiral shapes. I gently pulled the spiral rings apart and connected the ends forming a circle. I inserted the glass candleholder I would be using to make sure of the sizing. I closed the loops with needle nose pliers and made "feet" by squeezing the loops tightly together to hold the glass container. I also inserted another stem wire forming a circle through the loops for added support. Next, I added different lengths of individual stems in random patterns to mimic the shape of coral and tying the connections with floral wire. I wrapped the connections with masking tape to avoid wire rust through the clay. One thing I didn't want to do was make a pulp out of toilet paper and flour. That was too messy when I used it before and would make a tedious project even longer. I saw a YouTube tutorial for a simple, inexpensive homemade flour, glue and water clay that said it dried hard as a rock and lasted for years, so I decided to try that. I made about five small batches . . .
rolling the clay . . .
and applying it to the stems, one section at a time, with water and a paint brush. The clay was very stretchy and easy to work with. I could rough it up a bit and added pock marks and lumps. It took me about three days, off and on, to cover the stems inside and out and letting it dry overnight. I could add additional clay by wetting it and smoothing it over the dried clay with a wet brush. 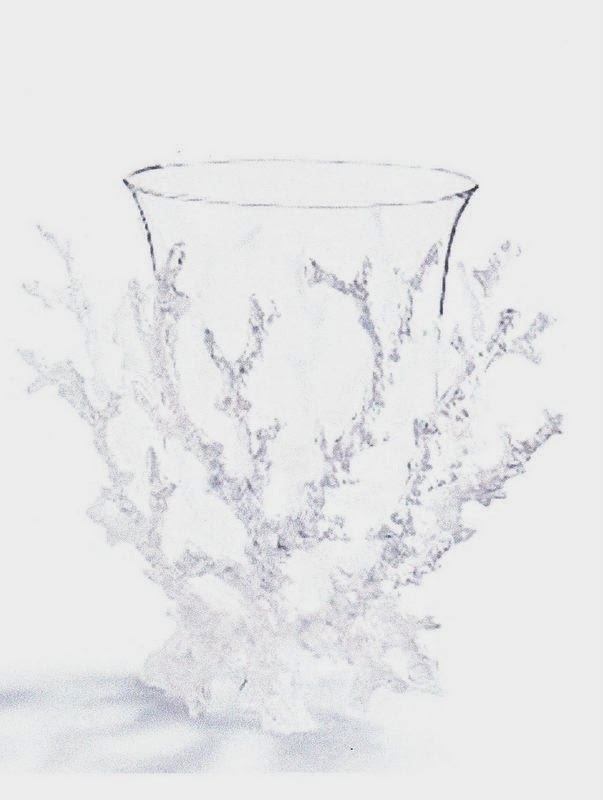 In between, I would try the glass candleholder on to make sure it was still fitting and that the "faux coral" could hold the glass in place. After I was satisfied with the overall look, I painted mod podge over the entire surface, outside and inside to seal and let dry. Then I decided to coat all of the faux coral with a sample of pure white chalk paint that I had. You can spray on a primer and paint with another type of paint at this point, if you want. I absolutely love how the faux glass candleholder turned out. And it fits in perfectly anywhere on my patio. Have you had a aha moment lately? That is pretty amazing - bet it looks pretty when the candle is lit at night too. You are so creative! Oh my goodness! That is beautiful! Thanks for sharing! OMG!! Such a great idea!! Love it! Just found your blog through Hometalk and I'm totally blown away by this project. Pinned. I would love if you linked up at the Merry Monday Linky Party on Sundays at 6pm PST. Oh I love this. 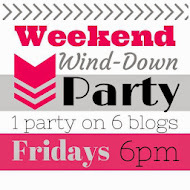 Thank you for linking it to the Weekend Wind-Down Party. 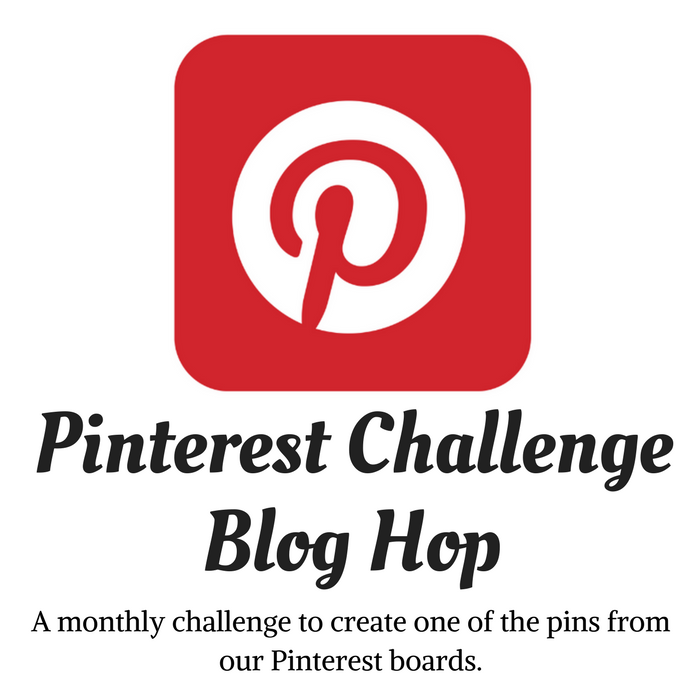 I hope you'll include a link to us on your site so we can pin and feature your posts! How do you keep them coming? That's so pretty nd pure genius! What a great way to make your own candle holder with style! Would love for you to share at Fridays Unfolded! WOW!!!! I love it you are so creative! Amazing. I can't believe how real it looks. You've outdone yourself with this one Gail! It looks sooo real. I honestly think you could recreate almost anything. You just amaze me!! Very clever - I like the way the coral came out, I bet it would be pretty in purple. What a gorgeous labor of love! Have you painted it purple yet?? You know I'm always happy to see your beautiful patio girl! Looks amazing. What a lot of work you put into it! And can't beat the price tag...just goes to show with a little work & creativity you don't have to spend lots of money for a great look. OMG That is amazing...I am still amazed at your genius. I would have never thought of that, not in a million years! Wow! 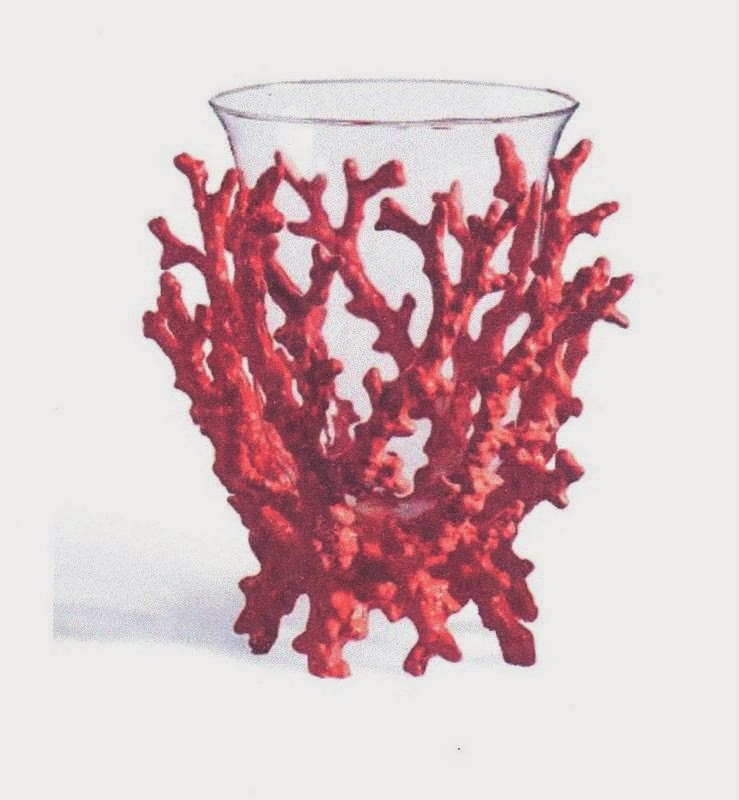 This faux coral candle holder is amazing. Well done! Wow!! I love it! Pinning so I can make one of my own! 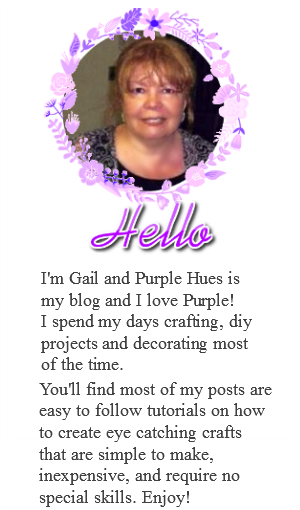 Thank you so much for taking the time to link up at the Merry Monday Linky Party. I'm still in awe of your project. A ton of work, but a great idea for a rainy week ;) LOVE how it turned out! this is so crazy that you made this. I was convinced when I saw the picture that you purchased it somewhere. Amazing! It even looks great by itself as a sculptural piece. So clever! Whqt a great tutorial - love the finished product - so very pretty. I meant to say, Wow, love this project, thanks for sharing! Your yard looks lovely too! Yours looks great. I made some faux coral a few months ago and mine didn't turn out nearly as well. Great job! I found you via Fluster Buster's Creative Muster. If you're interested in linking up to new parties, I've got one that's going live at 6 tonight. I'd love to have you over. This is great... and your patio set is cool too! Stopping by to Thank you for sharing at One More Time Events and let you know you have been featured at this weeks party! Wow! This is amazing! 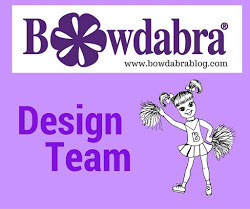 Thanks for sharing with us at Your Designs This Time!